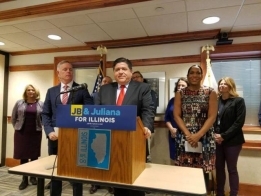 November 8 – Decatur Julie Moore Wolfe has been selected as one of 18 members on the Budget and Innovation Committee for Governor-elect J.B. Pritzker’s transition. The committee is the first of several working groups of subject-matter experts that will advise the incoming administration of Pritzker and Lt. Governor-elect Juliana Stratton. Former state Comptroller Dan Hynes will chair the committee, which also includes State Sen. Andy Manar. “The Budget and Innovation Committee will mold the guiding moral document that is our state budget and develop inventive solutions to move Illinois forward,” said Stratton. Moore Wolfe said her broad experience will help the committee in seeking economic solutions. “I used to run the Chamber of Commerce, so I have a pretty wide background in what the business community needs to grow and to be innovative,” she said. Moore Wolfe said she already seized on a chance to familiarize Pritzker with Decatur and the importance of the farming industry. “I had the opportunity to take him to the Farm Progress Show and show him up close and personal what agribusiness means to the state of Illinois,” the mayor said. “I’m going to tell Decatur’s story to anybody I possibly can and I am very thankful that he recognizes the importance of downstate, because this isn’t just Chicago.